The Sam Masich Internal Arts Library Project is now up online! Things are starting to take shape with the help and contribution of many students, colleagues and friends. Thank you to those who have made book, video and other offerings over the years. I believe with the enthusiasm and support of our taijiquan community, we can make this library a world class resource. I want to especially thank Rachel Scherer and Brandon Shaw for their excellent work in archiving the library thus far! Gradually we will expand the number of books available on the SamStore. These will include new, used and duplicate books received. Sam has collected a few titles over the years expressly for the purpose of library fund-raising. � We need a VHS to DVD archivist in Vancouver B.C to convert martial arts footage Sam collected through the 80s and 90s. Please email if you have skills that could be of value and would like to donate some time to the library project. � We need a Chinese language helper in Berlin for archiving the dozens of Chinese titles Sam has collected throughout the years. � per $100 donated: One instructional DVD of your choice. � per $300 donated: Two complimentary instructional DVDs of your choice plus a SamSongs CD of your choice. � per $500 donated: One full set of the Sam Masich Video Classics Collection. � per $1000 donated: One full set Sam Masich Video Classics Collection plus all SamSongs CDs in print. The library can also use donations of time, especially as it gains more online presence, for things like categorizing, researching potential materials and posting information. Library needs are posted at library news. 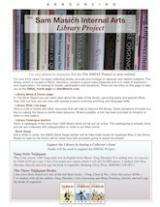 If you�d like to discuss how you can help with the Sam Masich Internal Arts Library Projectplease don�t hesitate to contact. � Occasionally people decide to divest themselves of their taiji library. In such cases I would like to be contacted and make arrangements for acquisition. � Sometimes libraries make available texts no-longer-needed at a discount. � Do you know of an Asian Studies department person or martial arts school that might be open to letting you know if they are getting rid of books? � Are you an author that could donate something to the library? � Are you looking to lighten your load by giving some taiji and martial arts books to good-will or sell second hand? � Bored & helpful? Scour around the 'net for give-aways and good deals.